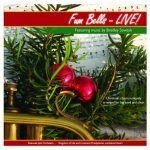 Local Columbus pianist, multi-instrumentalist, recording artist, composer/arranger, collaborator, author, educator and Columbus Jazz Academy piano teacher, Bradley Sowash, has just released a new Christmas album entitled, Fum Bells – Live!. This is a Christmas album of your favorite Christmas classics uniquely arranged for big band and choir by Sowash from the Covenant Presbyterian Church in Roanoke, VA. In 2008, Richard Rudolph, director of music for Covenant Presbyterian Church in Roanoke, VA had an unusual vision: to combine his traditional music-reading choir with the nearby Kingdom of Life sing-by-ear gospel choir to perform Christmas classics. Furthermore, a 17-piece big band would join them instead of the usual piano accompaniment. However, sacred Christmas music for this combination of musicians and singers was not available. So Richard commissioned Bradley Sowash, who had previously been a guest artist with the church, to write new arrangements. The community responded enthusiastically by filling all of the Covenant Presbyterian pews and the standing room areas for two shows. Richard then commissioned five more Christmas arrangements intended to premier the following holiday season. On the scheduled December date, however, an epic snowstorm forced postponing the concert until January. Despite the unusual timing of a post-Christmas holiday concert when most herald angels had ceased singing and halls were no longer holly-decked, the community turned out again for another successful program. This recording preserves that concert, captured live with no overdubs or multiple takes. You hear it exactly as it happened. Buy Fum Bells – Live! Bradley Sowash has performed with such luminaries as The Cab Calloway Orchestra and The Mills Brothers. As a soloist and bandleader, he has delighted listeners of all ages in concert halls and churches throughout the United States and Europe for over two decades garnering enthusiastic reviews in national publications including The Village Voice and Billboard Magazine. His broadcast credits include National Public Radio and he has been a frequent guest on the PBS-TV series, The Piano Guy for seven seasons. His publications include several volumes of jazz hymn arrangements published by Augsburg Fortress Press and educational jazz piano books published by the Neil A. Kjos Music Company and Houston Enterprises. He also writes and arranges for ensembles of all sizes from string quartets to big bands and full orchestras.